What kind of outing does a professional adventurer pursue on her day off? 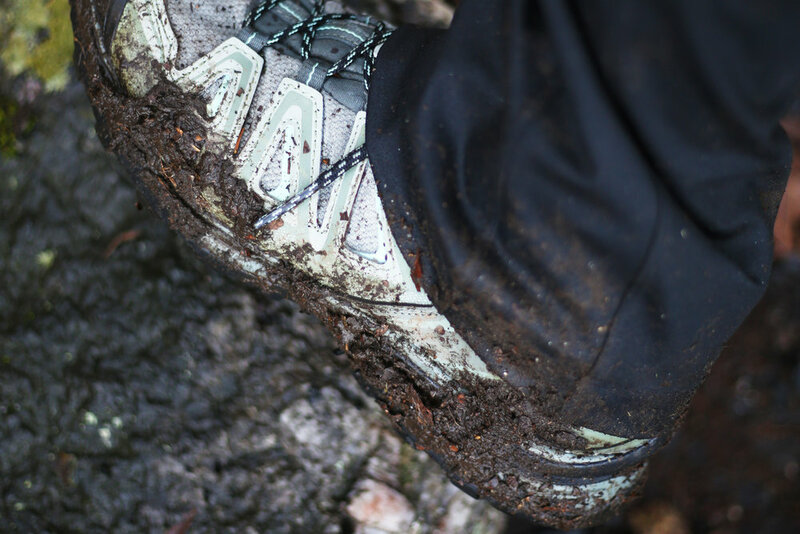 For TB&C Ambassador Marley Parker, hiking a steep, rugged trail with her brother (through slick mud and pouring rain) is the perfect way to reset, and to recognize the perks of a perennial bond. 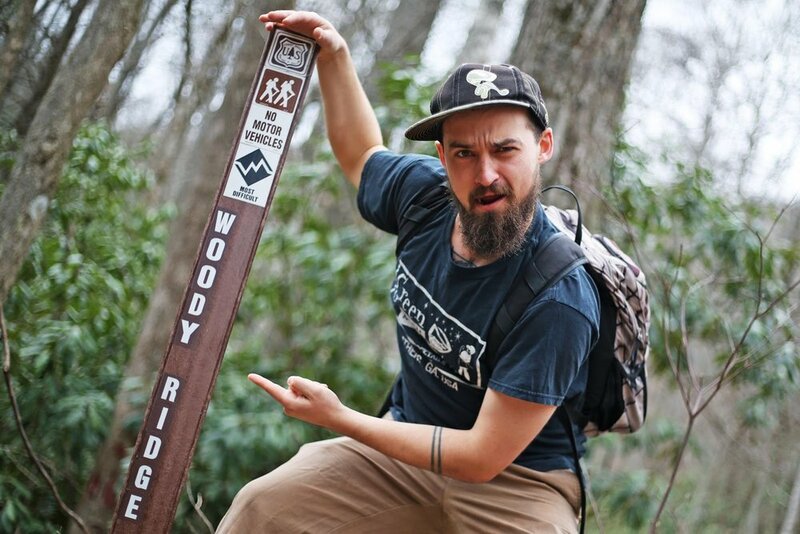 Woody Ridge is one of the steepest and most difficult trails in North Carolina. Five minutes later, my brother and I hop out of his SUV, grabbing our day packs, water bottles, and rain coats. Right now, the overcast sky and light breeze generate inviting hiking conditions—cool and crisp—but the forecast calls for rain later today. I snap a photo of Austin next to the Woody Ridge sign. While many dear friends and down-for-the-cause adventure buddies have joined me on this steep, remote trail (my favorite in all of North Carolina) no one has accompanied me more times than my brother. I smile at his stoked expression, grateful for both his company and his enthusiasm. Since we were teenagers, Austin and I have been tight. And it seems the older we get, the closer we become. As a self-employed expedition photographer and videographer, my lifestyle is characterized by transience: I don’t have a mortgage or a serious romantic partner. I travel a lot for work and for fun. I make enough money to pay the bills, but my income is always unpredictable. I try not to worry too much about the future, and I value the present moment. 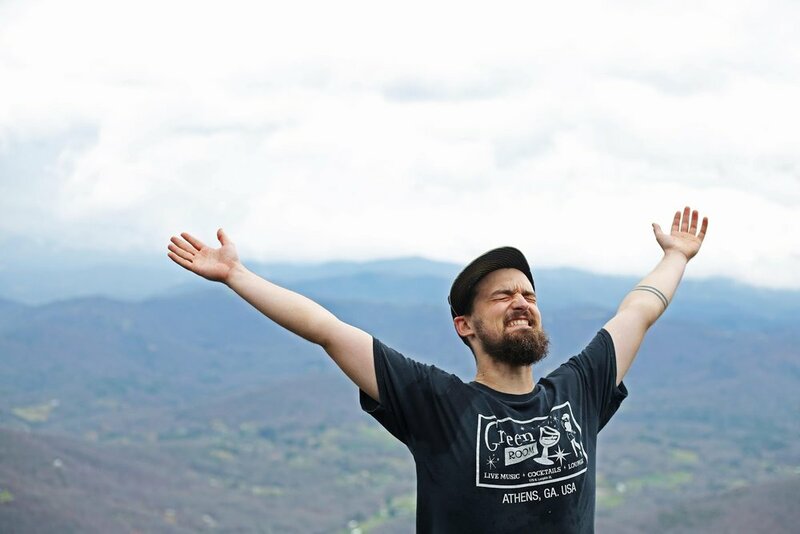 As a professional musician, my brother’s life is dominated by travel. He and his band play over 100 shows a year so he is constantly on the road. He is single, lives with roommates, and pays cheap rent. Like me, he values experiences over money, prioritizing the pursuit of his passion over a more traditional, “stable” career. We also both enjoy the perks of a flexible schedule. It’s a Monday morning and neither of us needs to be heading into an office right now. Instead, we’re hiking up a mountain. Celebrating the glorious views at the top of the hardest section of the Woody Ridge Trail. My amazing brother, smiling through the storm. The more I ponder these similarities, the more I realize how few people in my life (in North Carolina at least) share these things in common. My friends in Chapel Hill and Durham often chat about planning weddings, buying houses, or hosting baby showers. During these conversations, I smile and nod, and try to find creative ways to relate to them. Conversations with my brother, on the other hand, assuage my insecurities and energize my spirit. 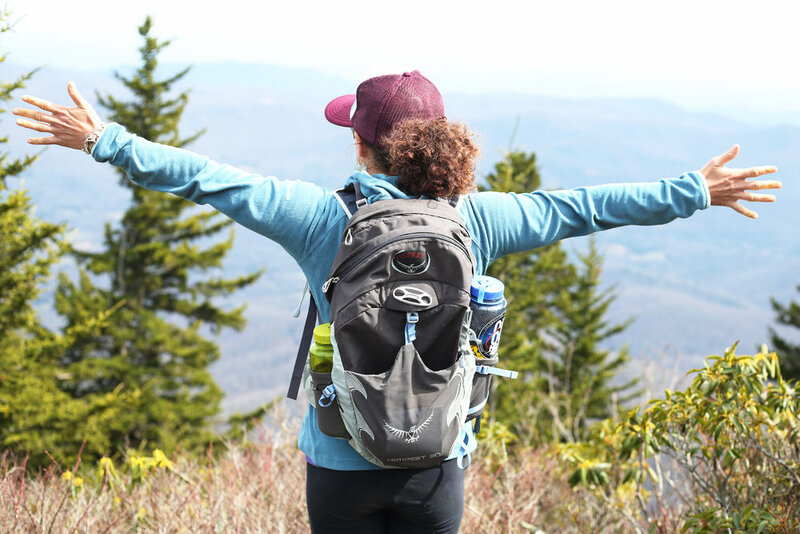 As we clamber up the steepest part of Woody Ridge (over 1,000 feet of elevation change in less than one mile) we talk about the importance of exercise and eating well, even when we’re on the road. We both try to maintain a routine that includes running, yoga, weight training and healthy, home-made meals—but we also know that life gets in the way and we can’t berate ourselves for missing a workout. Our discussion slows as we labor up the rocky incline. “Never skip leg day!” Austin says sardonically, referencing the burning in his thighs. After two hours of hiking, we reach the top of the mountain, where we promptly plop down on the wet ground to enjoy some well-earned drinks and snacks. Our conversation veers into love and relationships, briefly discussing a short-lived fling I had earlier this year, then diving into how Austin has found solace and healing in the wake of a breakup. Assessing the amount of mud that has accumulated on every article of clothing after slipping and sliding down the steep section of Woody Ridge. My brother is 27. When I was his age, I experienced a significant heartbreak that left me desperately clinging to a tenuous love. Listening to Austin describe his methods of coping and his ability to engage in healthy self-care impresses me, to say the least. Austin takes a sip of beer and gazes at the ridgelines in the distance. He doesn’t say anything, but I think he is proud of himself too. Yoga outside (and in the mountains) is the best. I shove my water bottle back into my pack, and feel the first few drops of rain smack my forehead. “We should probably start heading down, yeah?” Austin says. We don our raincoats and start our trek back down the steep, rocky (and increasingly muddy) terrain. The further down we go, the harder the rain falls. Austin helps me zip my rain coat over my pack to protect my camera from the moisture. The following morning, we drag our yoga mats outside to bask in the glorious sunshine. Austin snaps a few photos of me practicing handstands, then leads us in a Sivananda yoga practice. After the cold rain yesterday, the abundant sunshine and fluid yoga motions act as a soothing balm. When we go into boat pose, I feel a fiery sensation in my quads, tight from going up and down the relentless elevation of Woody Ridge. After a few deep, focused breaths, the tension releases. Capturing the first light of the day wash over the Toe River Valley. At the end of our yoga practice, I lay on my back and stare at the infinite, blue sky above me. I consider how this place (the Toe River Valley in the Black Mountains) and this person (my dear brother) generate a perfect intersection. South Toe is where I feel the most whole. Austin is the person I trust most in the world. That means that right now, and for the two days we spend up here, I get to be the most honest version of myself. My self-doubt and anxieties wash away, like dirt down a mountain in a storm. The following morning, we pack our cars and prepare to head back to “real life”. Austin has one day at home in Athens before the band goes on tour again. Meanwhile I’m about to make a long drive (from the mountains to the coast) to document marine scientists in Morehead City. He’s right—these trails contain so much more than fresh air and epic views. As a brother and sister duo who make it a point to come up here, the experiences we have in these mountains serve up several important reminders: to cherish this time together, to check in with each other and with ourselves, and to appreciate the parallels in our peripatetic lives.